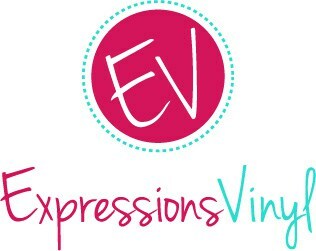 Happy Birthday Expressions Vinyl and a GIVEAWAY!! - winner announce too! 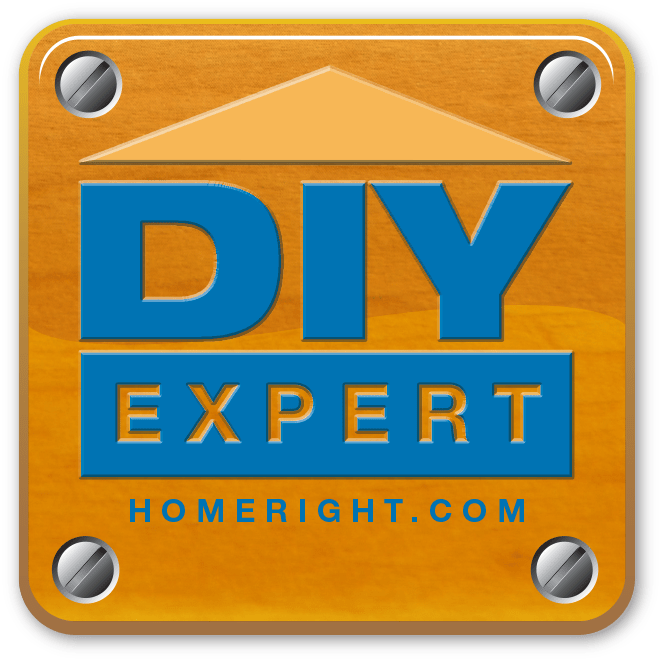 Home » Happy Birthday Expressions Vinyl and a GIVEAWAY!! – winner announce too! Happy Birthday Expressions Vinyl and a GIVEAWAY!! – winner announce too! I have been so lucky to be able to work with Expressions Vinyl for a while now and I am so happy that I am able to help them celebrate their BIRTHDAY this week! I love birthday celebrations and this year, Expressions Vinyl is going all out! If you don’t already like Expressions Vinyl’s Facebook page, I highly suggest you do! This week there are games, festivities, coupon codes and GIVEAWAYS from Expressions Vinyl and liking Expressions Vinyl on Facebook is one of the best ways to keep up to date! Also, did you know that Expressions Vinyl regularly sends out coupon codes through email? 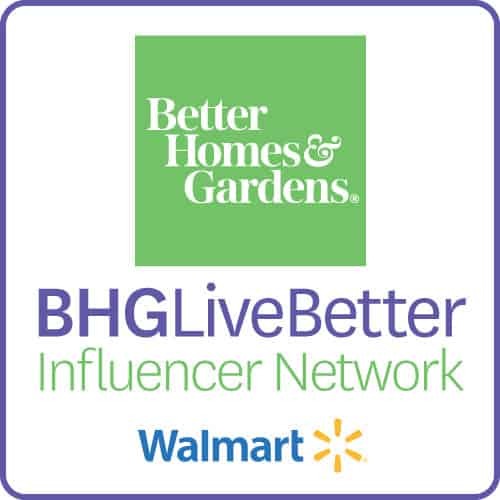 Be sure to join their email list so you can be sure to get their latest coupon code! Expressions Vinyl has also re-vamped their shipping prices and now, smaller orders can ship for less $ and all orders over $75 ship FREE! Wow! Expressions Vinyl has always had the BEST prices on their vinyl and they keep their product selection so competitive! They are honestly, the first place I go when I need / want to buy vinyl! I am so excited that they now carry products to put my vinyl on like the t-shirts, tumblers and canvas tote bags! But I was even more excited when Expressions Vinyl offered to send me a package including samples of many of their new products to play around with! I got a whole huge variety of their new vinyls, two tumblers and a canvas tote! And I get the opportunity to GIVE AWAY a similar prize package as well! 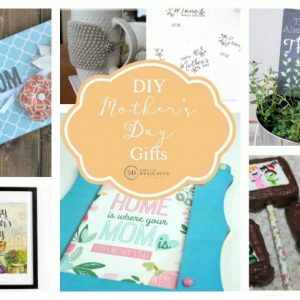 But first, I want to show you a few things I have created using my awesome prize package! 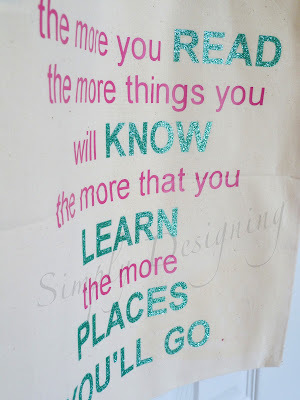 I used Expressions Vinyl Canvas Tote Bag, Glitter Heat Transfer Vinyl in Jade and some pink heat transfer vinyl I happened to have laying around to create a Library Bag for us! 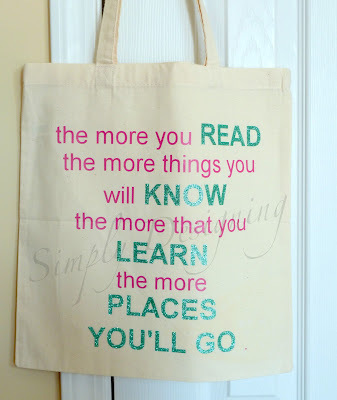 We frequent the library so often in the summer, I needed a good way to carry and store our books! 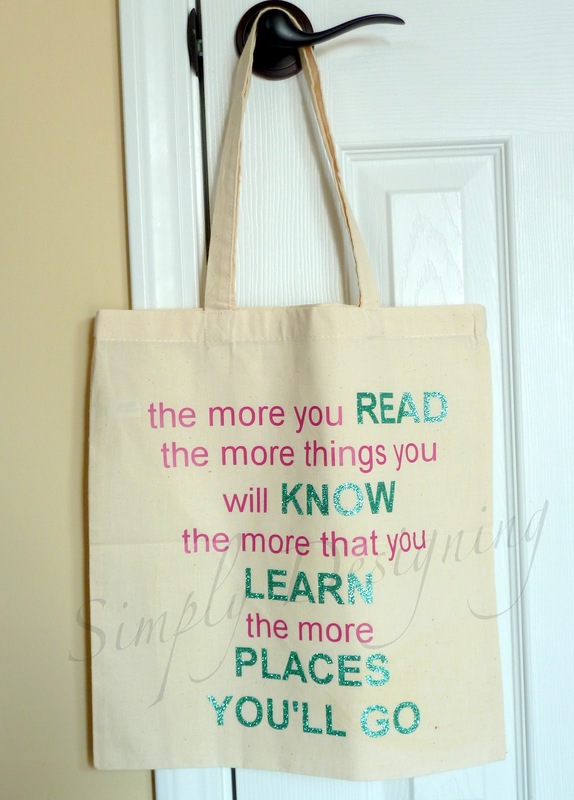 Their canvas tote is the perfect size for a library bag! 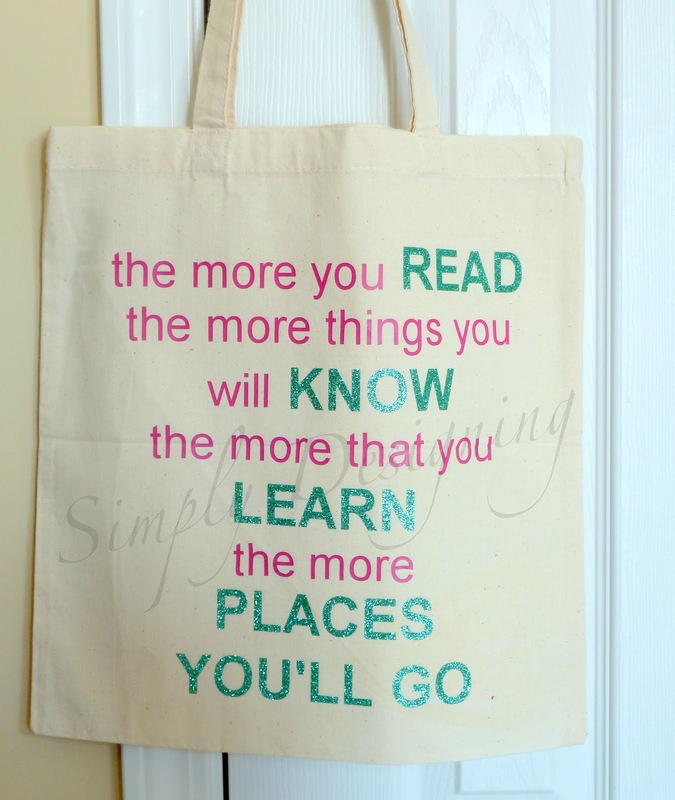 And I love this quote by Dr. Seuss, so it just seemed fitting to put this on our library bag! 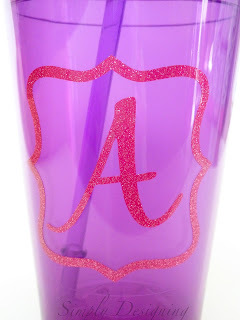 And I love how sparkly the new Glitter Heat Transfer Vinyl is!! It just makes me smile looking at my pink and jade sparkly bag!! 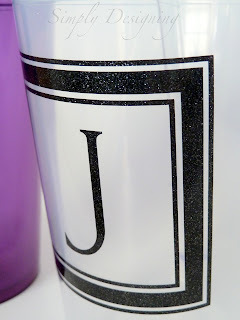 I also love Expressions Vinyl’s new Tumblers! 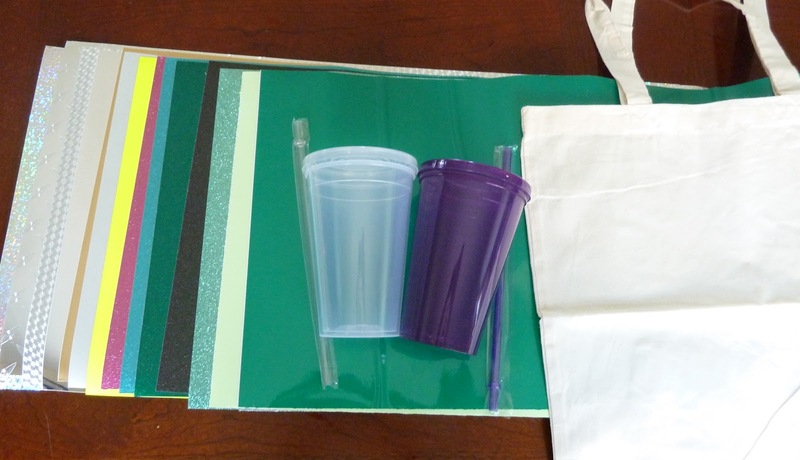 The are BPA free and dishwasher safe and they are made out of a softer plastic then most acrylic tumblers out there. This means they are more kid friendly and can be dropped without being broken! Hurray! 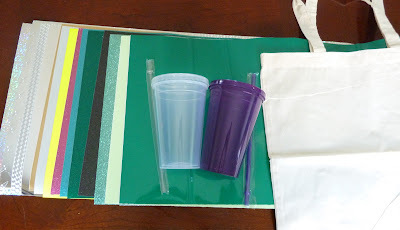 And while my kids were begging for both of these…my husband and I spend a lot of time out doors and we needed plastic cups we could use while in the yard. My kids are still young enough to use sippy cups…us…not so much. 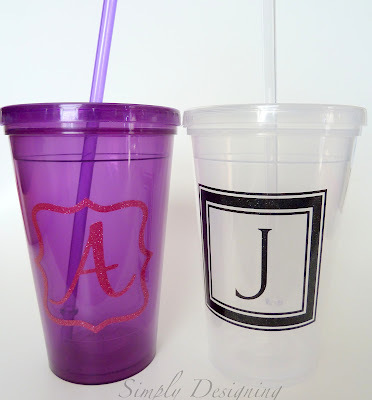 So I decided to monogram these tumblers up real quick for my husband and I! I used Glitter Ultra Cast in Black and Melon. And aren’t they just so pretty!? 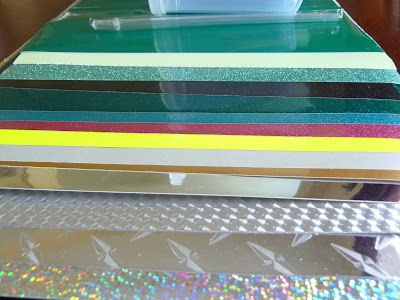 I love the great selection of Glitter vinyls they now carry…they are so fun! 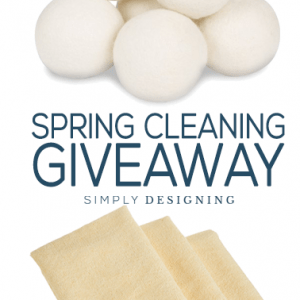 I have contacted you via email, but you still have 72 hours to contact me at simplydesigning@gmail.com with your information in order to claim your prize pack! 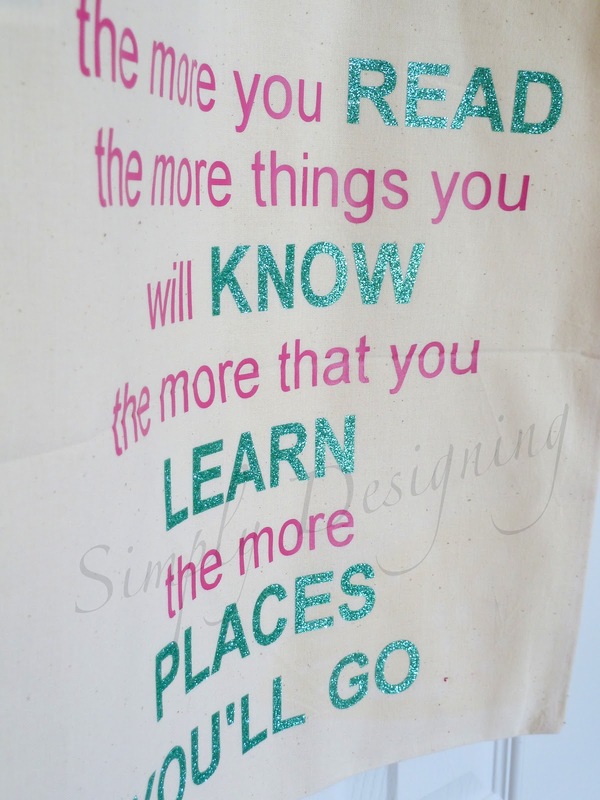 LOVE the quote on the library bag and your choice of colors on the vinyl! BEAUTIFUL!! 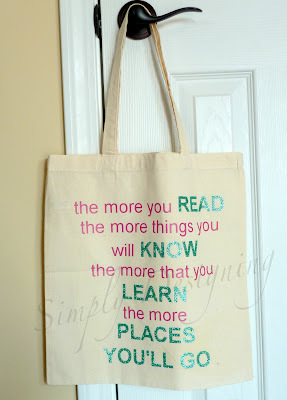 Great way to carry your books! Love the saying! I love what you did with the canvas bag! Can&#39;t wait to make my own!!! Thank you for such a great idea! I love what you did with the tumblers and the tote. I did a book themed tote too and am just in love with all the new Expressions products! Love what you came up with. 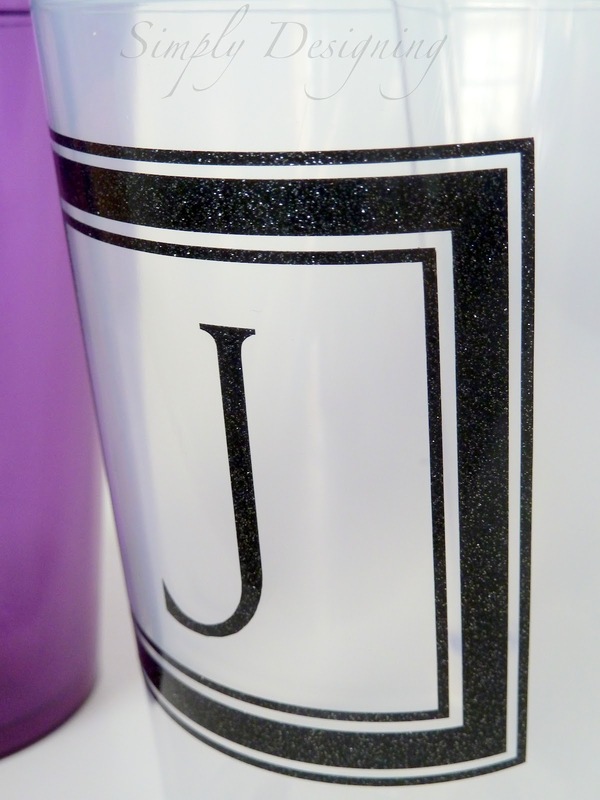 I really like the glitter on the tumblers.